We have had a few changes over the last few years so please be sure to read the site carefully. Have a look at the about us section to catch up... Three generations...still offering good old fashioned family fun! We are a familly run business so are not always by the phone... it is best to send an inquiry via the BOOKING REQUEST block on the left side of the webpage. This is the fastest way to get a reply. It will ask for your phone number. Please ensure you type your email address in correctly or the response will not get back to you. For telephone inquiries please call between 9am and 6pm. A machine does not answer the phone at midnight :) A Grumpy rancher does :) We do use facebook to promote activities but do not take booking inquiries on facebook - please use the booking request link on or website. Thank you so much! 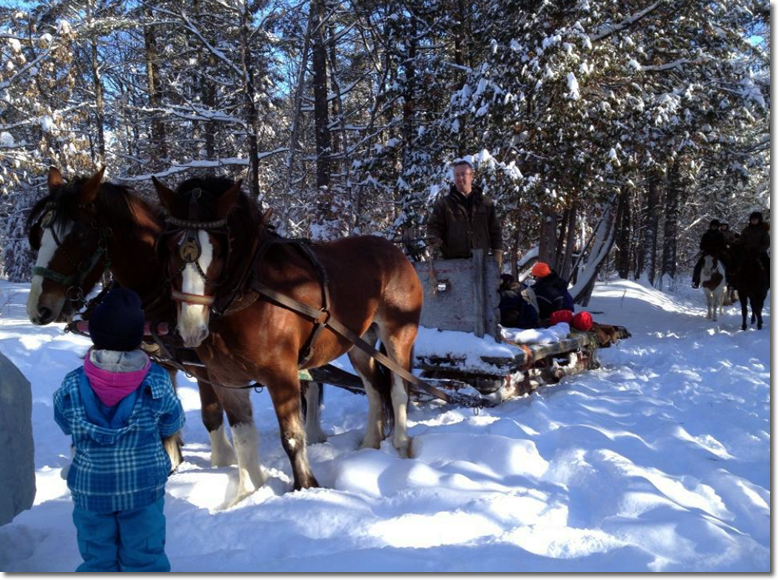 The sleigh is pulled by a team of wonderful horses out along the scenic trails through the forest for 45 minutes to 1 hour. The sleigh holds 20 people max. This number includes adults and children.... We never want to overload the sleigh for the horses ;) feel free to bring blankets and snuggle in with your friends and loved ones. Check out our "Day with a Horse section!" This is a new program started in the spring of 2016. Indoor boarding now available - $400.00 + HST per month. Please enquire. I met Tracey about 4 years ago, I came to PVR to do an hour trail ride as a 40th birthday present to myself. I hadn't ridden in about 25 years and was excited and extremely nervous. From the minute I met Tracey, I could tell that she was a caring, warm and thoughtful person. Tracey has taught me so much over the years about how to read a horses body language, patience, being calm and confident around them and pushing my boundaries when she knew I could handle it (even though I didn't think I could). I still learn every time I go to Pinto Valley Ranch, she takes the time to answer my questions and coach me in a way I understand, so I can be a better person for my mare Nova and in my life all around. Again I wanted to thank you, this will be a day that Briana and I will remember forever. I have attached some pictures of our day.